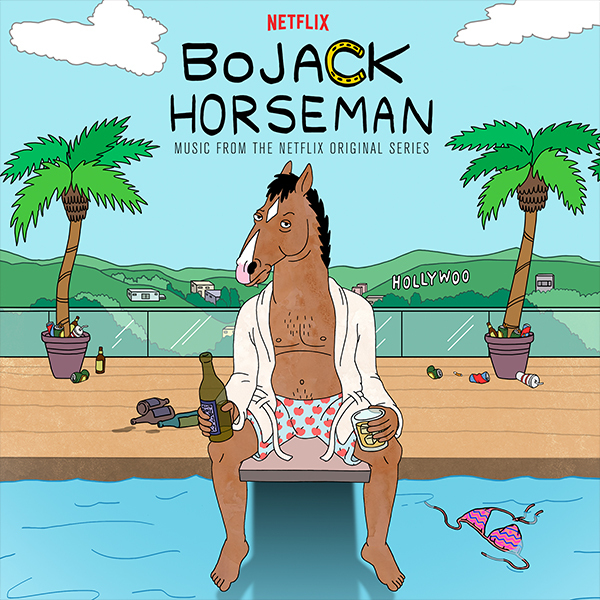 Lakeshore Records will release BoJack Horseman (Music From the Netflix Original Series) digitally September 8th, on CD September 29th and vinyl coming this winter. The soundtrack features the iconic main title track by Patrick Carney, and the infectious closing theme by Grouplove. Michelle Branch, Oberhofer, Nina Simone and original songs and score by Jesse Novak are also featured. The album was produced and music supervised by Andy Gowan. The award-winning “underwater” episode, “Fish Out of Water” is showcased on the entire “Side B” with indie pop band Oberhofer’s “Sea of Dreams” and original score and composition from Jesse Novak. Series composer Jesse Novak, who, in addition to BoJack Horseman, is also currently composing the score for The Mindy Project. Prior to his work as a television composer, he has contributed as a player and engineer to recordings by artists like MIA and Vampire Weekend and released music under the name Tugboat. Says Executive Producer Noel Bright: "Jesse is equally comfortable punching a funny scene with a silly note and scoring a sad scene with a heartbreaking melody. His music elevates every moment of each episode." Says Novak: "Writing the music for this show is fun for so many reasons. Making animation feel real and emotionally resonant, hitting the right tone to parody certain genres and pop-cultural aspects of music, and using timing to enhance a gag are just a few of the challenges that I love. It's also tremendously entertaining for me to work on a show that pokes fun at show business."